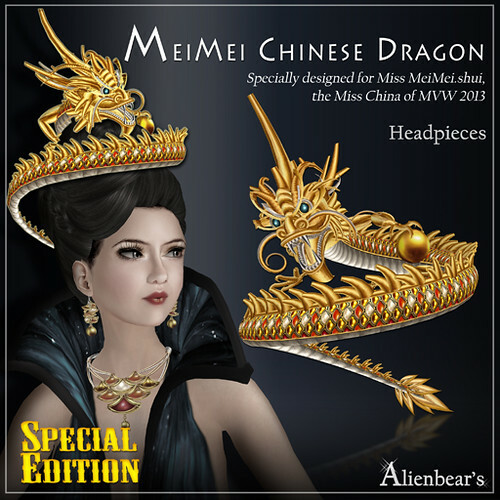 Back to the late 2012, Miss 薇薇 MeiMei Shiu approached me to design a jewel set for her Miss Virtual World Pageant in representing Miss China. And comes up this Chinese Dragon Series. After-then, I was busy and sick in real life. This original set was keeping in my inventory without any release until this year. 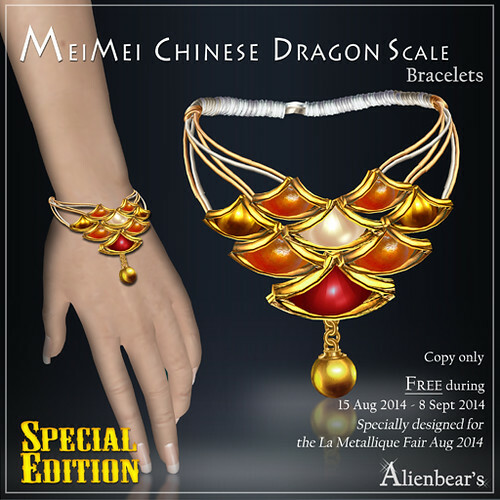 When Miss 薇薇 MeiMei Shiu invited me to her La Metallique Fair, this set brought up to my mind! For me, this dragon set is representing this beauty. Since 2013 when I was away from sl, this lady started her own business successfully in sl. Just like a caterpillar took off the skin and change into butterfly in its development. "Skin of the Dragon" suddenly comes up to my mind. 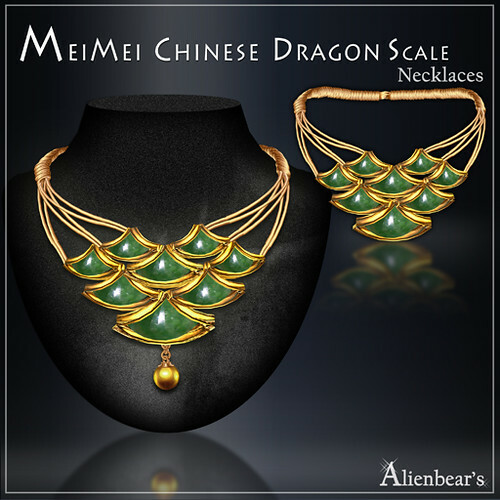 So I designed the dragon scale necklace for her fair. 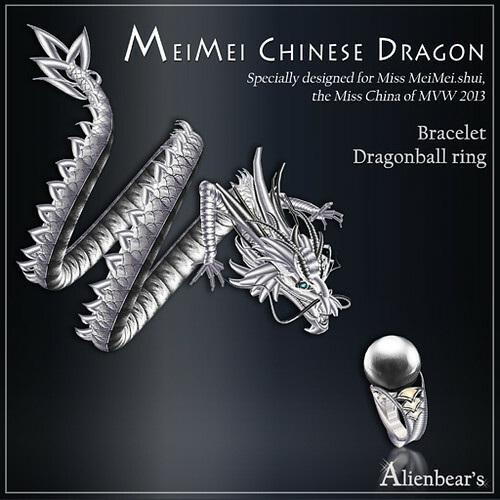 The Dragon series is named after Miss 薇薇 MeiMei Shiu. 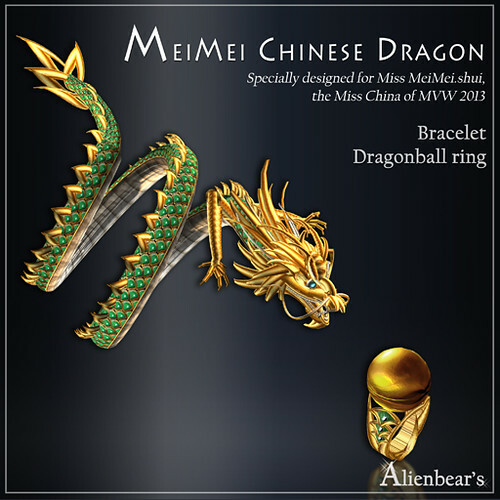 The primary full set is consisting of Dragon headpieces, Dragon earring and dragon ball earring set, Dragon scale earrings, Dragon bracelet with dragon ball ring (龍吐珠系列), Jade bracelet (not release yet), and Dragon head ring. 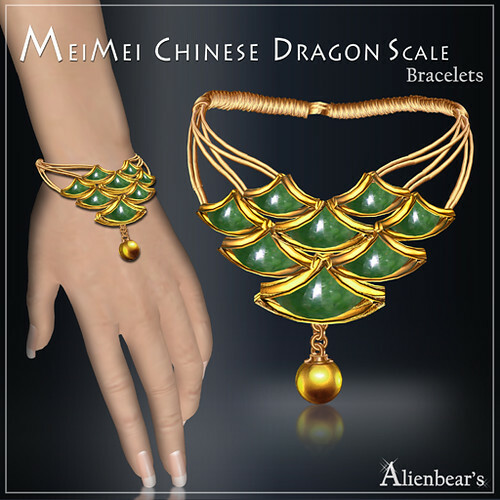 While the dragon scale necklace and the dragon scale bracelets are designed afterward in this year. 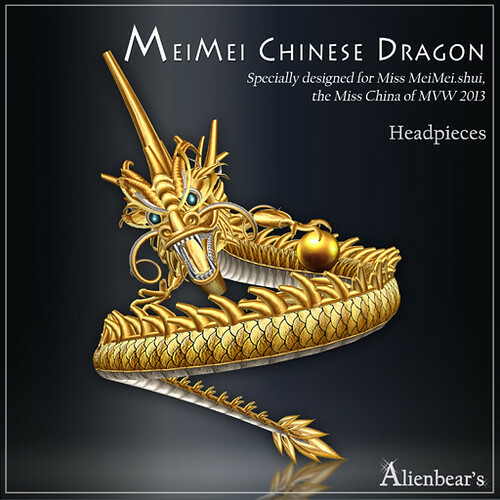 When 薇薇 MeiMei Shiu approached me to design a jewel set for her pageant in Chinese Dragon and Qing Dynasty theme, I was thinking to design a hat piece which the Qing Queen worn. But as I don't know how to make something in sculpted prim or Mesh, I finally change my mind to a hat-liked headpieces. In Chinese legend, the Chinese dragon always comes with a dragon ball, which is the spirit of the dragon. I crafted a dragon which holding a dragon ball. Dragon is the top of the world in Chinese tale. The expression of the dragon cost me a lot of time to craft in expressing how royal and how strong the dragon is. 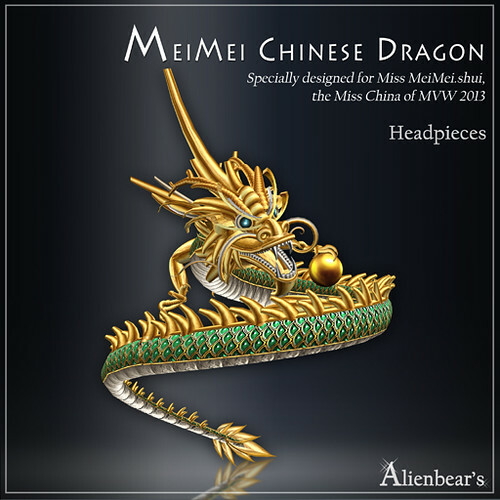 The Miss China head piece are in gold and silver's tone with teal eyes. Gold is the signature of Chinese. Silver used to help showing the details of the whole dragon. I select teal not red for the eye, as I want to express the soft and gentle of the beauty. And Blue is my brand colour, which is another reason I choose this colour tone for the spirit of the whole pieces the eye. The colour gems for the special edition is selected this year when I want to match the new scale necklace and express the successful and colourful sl life for 薇薇 MeiMei Shiu. Due to prim limitation, this headpiece have to be attached to 2 body point. Inside each pack, you will find "No bright" and "Full bright" version for the non- modifiable pieces. So no need to worry about wearing "a bright light" under the dark anymore. While you can still see what my designs original colour in "full bright" version. 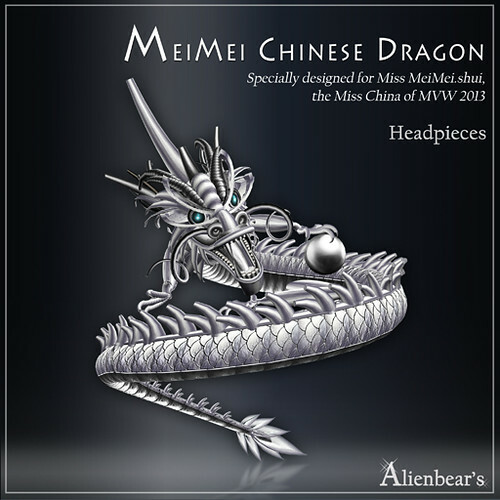 (nb) stands for "no bright"
This dragon earring, which wear in left ear, is designed to match the headpiece. It was designed to balance the headpiece. 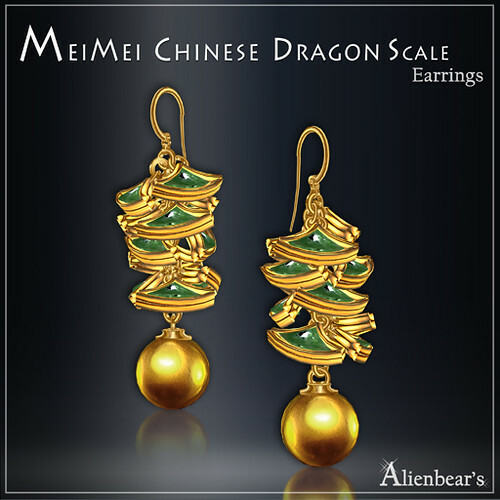 The original design of the right earring was the dragon scale earring in jade (please refer to the 1st pic) . 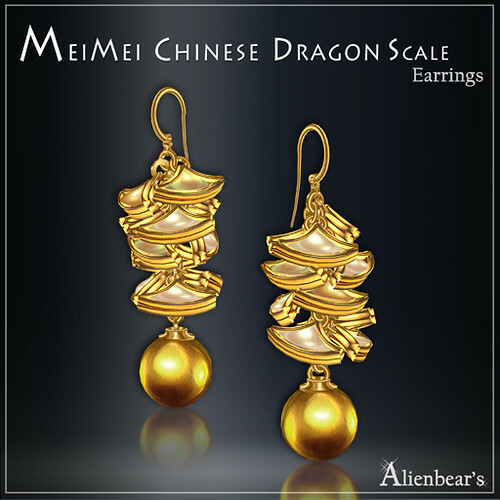 But Mui Mukerji, the CMO, suggested that the scale one seems not really match the dragon earring well. I thought it is right that it will be comes out so bulky if without the headpiece. Therefore, I make a simple dragon ball earring in matching this piece. 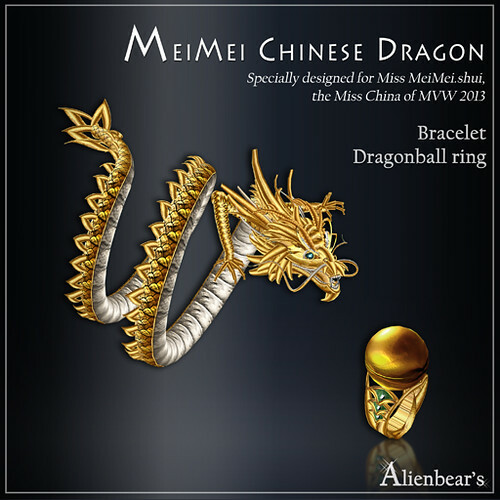 So in this pack, there is a pair of dragon ball earrings and a dragon earring for the left ear. Except the special edition, all are TRANSFER only. The special edition is COPY only that is for member only. Details can be found in the last paragraph. 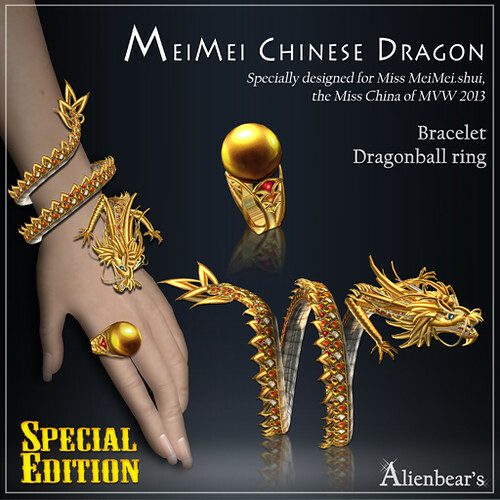 The Dragon bracelet and the dragon ball ring are in one pack as to express the picture of the Dragon chasing the dragon ball. The arm of the ring have the dragon scale pattern which gems are selected to match scale of the headpieces and earring. The bracelet is Modifiable and Transferable. While the ring is Transfer only. 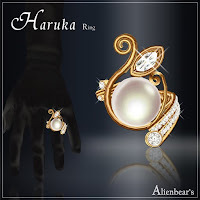 Although my pieces are not Mesh or Sculpted prim, I know many in sl are now using Slink Mesh hands, So apart the normal size of ring, here included also the ring that wear with slink hands. 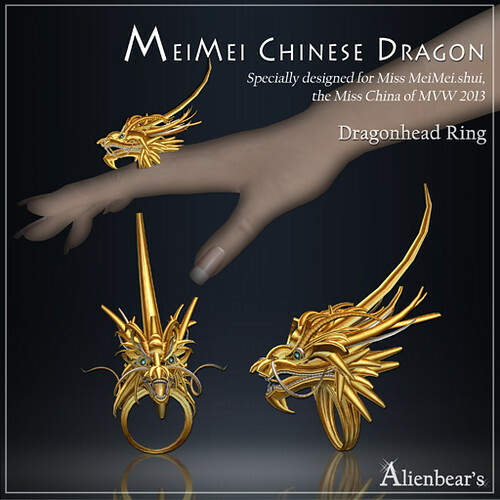 The right hand side of the ring is a dragon head ring. Huge and fancy. Just presented the royalty, power and the wealthy. 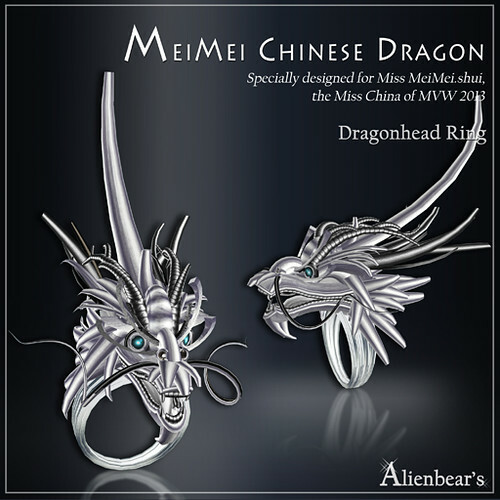 The right hand side of Dragon scale earring was designed to match the headpiece and the left dragon earring in my original design for Miss 薇薇 MeiMei Shiu. 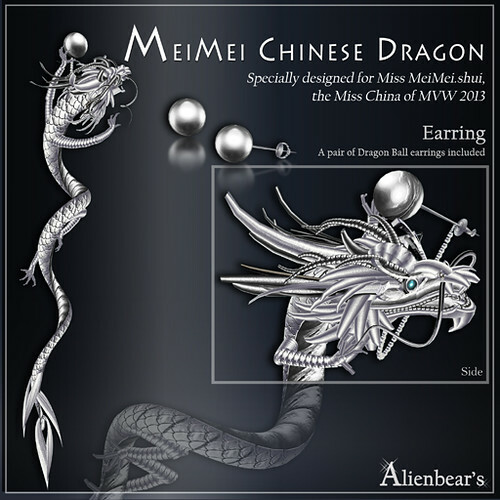 After I designed the Dragon scale necklace for the La Metallique Fair, I found this earring match the necklaces a lot. 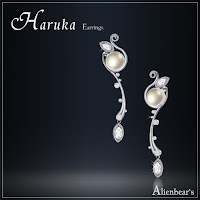 So I make it as a pair and comes up with this pair of earrings. 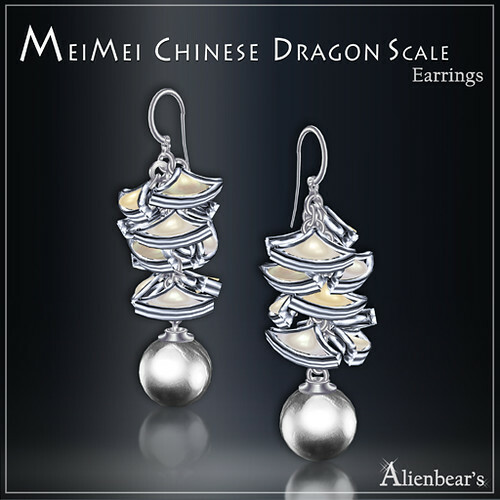 The idea of this earrings was the dragon scale with the dragon ball. The Special edition is just available at the La Metallique Fair for limited time. Details please read below. 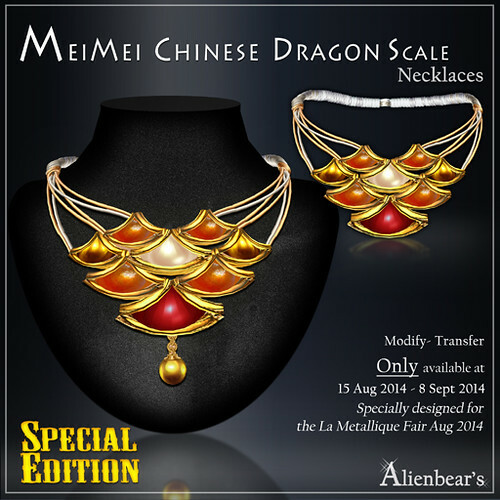 This special edition of the Dragon Scale necklaces are specially designed for the La Metallique Fair . 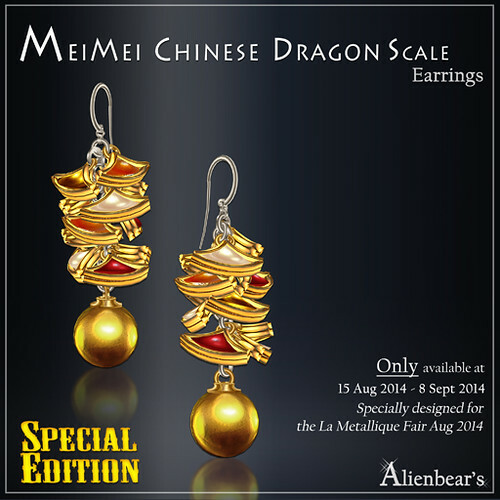 While the Dragon scale earrings was designed for 薇薇 MeiMei Shiu for her beauty pageant. 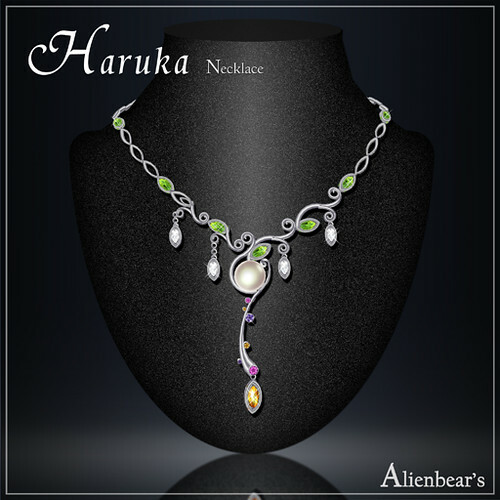 This Special edition colour tone is selected as the limited time jewel pieces for the fair.The idea of the necklace is the skin of the dragon. Imagine tearing part of the dragon skin from my Dragon headpiece, the one in special edition colour tone. The colourful scale are the top part of the dragon while the silver tones part are the lower part of the dragon. Representing "changed" to another stage. Each necklace pack come up with 2 necklace, one with the dragon ball and one without. 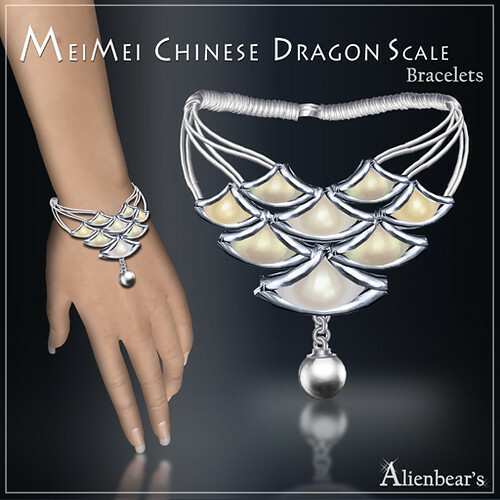 The Chinese Dragon Scale bracelets were based on the scale necklace to craft. Although my pieces are not Mesh or Sculpted prim, I know many in sl are now using Slink Mesh hands, So apart the bracelets that fitting the sl build-in hands, here included also the bracelets that wear with slink hands. The Special edition in COPY only version is FREE at the La Metallique Fair for limited time. Details please read below. Necklaces are transferable and modifiable. 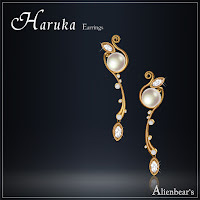 While earrings are transfer only. This gift version is Copy only. - touch the board to get it. Hey guys and girls, been a long time didn't release anything new. As second life keep updating, Alienbear's can't stand still. Because of that, We are now rechecking and refreshing all our designs. 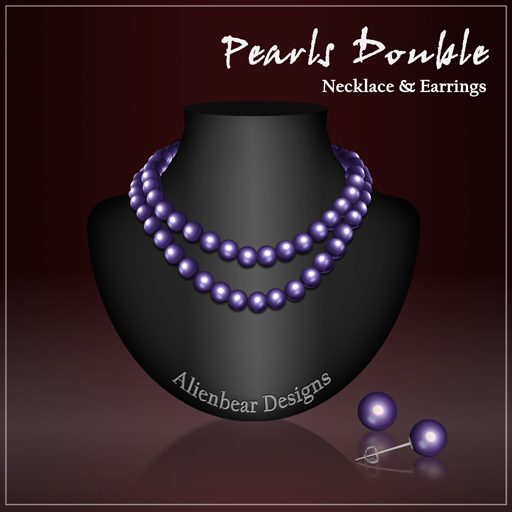 Do you remember our 2006 double pearls $20L set? Pearls double white was my Oct 2009 creations designed for an hunting event. In 2010, I created a black pearls version as member gifts (copy only) and almost free $20 version (transferable with necklace modifiable) for celebrating our 5th Anniversary. 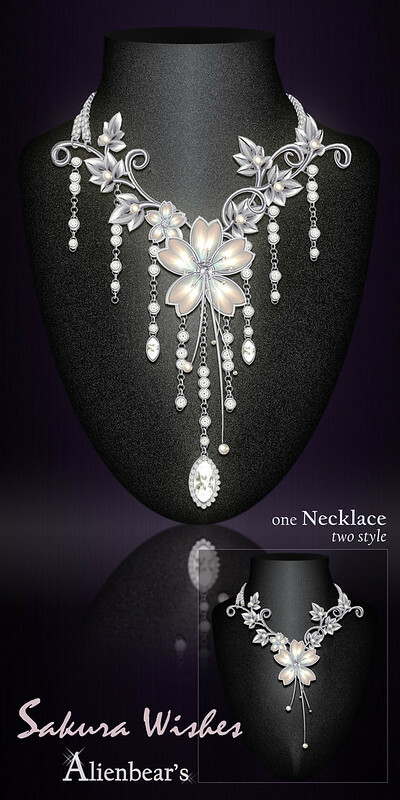 This year 2014, when refreshing all of my designs, I suddenly found that my purple pearls look mysterious on this design. 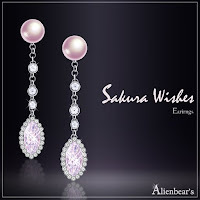 So comes up 3 colour of pearls for your selection. Inside this pack, you will find "No bright" and "Full bright" version for the non- modifiable pieces. So no need to worry about wearing "a bright light" under the dark anymore. While you can still see what my designs original colour in "full bright" version. Our 50% off sale will end soon! On the day when I refreshing all my design, it will be the end of the 50% off sale. What are you waiting for?! Crazy shopping at Alienbear's Now! To celebrate Chinese Luner new year & Valentine's day, We will extend our 50% off sales to 28 Feb 2013!!! Don't miss this last opportunities to buy gifts for yourself, your friends and your girls/boys in these romantic seasonal celebrations! Some jewels will be removed or remake after sale. All items are transferable except freebies, member gifts and fatpack. 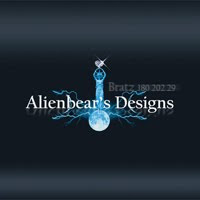 Alienbear's been with you for 7 years! Time to have a change and move forwards. 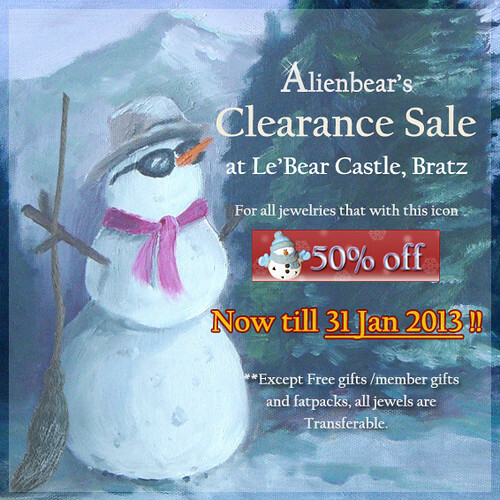 To thanks all of you guys been supporting Alienbear's for years, we are going to have a 50% off clearance sale! Don't miss it! Some jewels will be removed or remake after sale. All items are transferable except freebies, member gifts and fatpack. Sakura Wishes was my last year 2011 April design. By request, the matching pieces including the forehead tiara and earrings are available for all gorgeous ladies. You can now also find Sakura wishes in white gems. 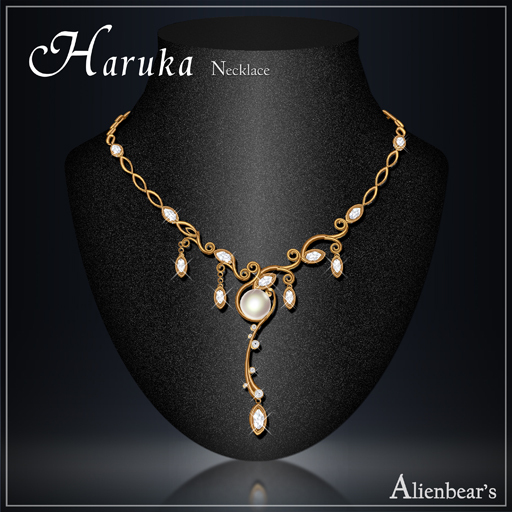 Due to sl prim limits, This necklace have to be attached to 2 parts of body and this comes out 2 styles. 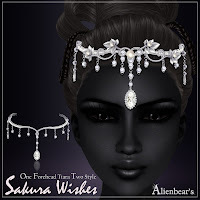 Due to sl prim limits, This forehead tiara have to be attached to 2 parts of body and this comes out 2 styles. 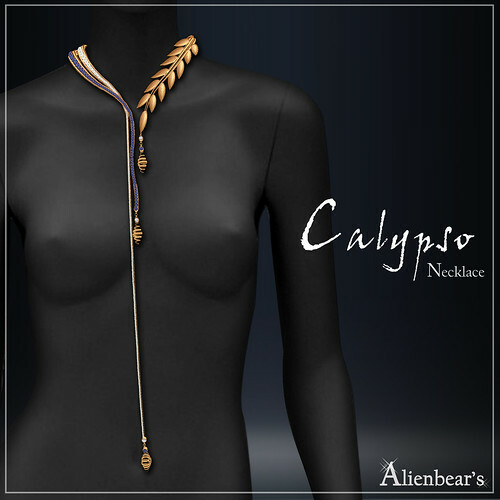 Calypso was my last year Nov 2011 virtual jewelry design which specially designed for the MVW Miss Greece 2012- Miss Calypso Oliphaunt for her formal section of the pageant. I get inspiration from traditional Greek Olive leaf, flag of Greek, Greek goddess tales and Calypso formal gown from Mami Jewell. 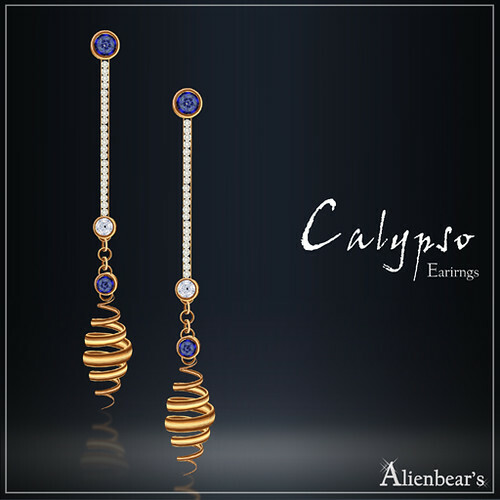 Blue Sapphire and diamonds are selected as the gems for this design is because of the colour of the Greece's flag are mainly blue and white. 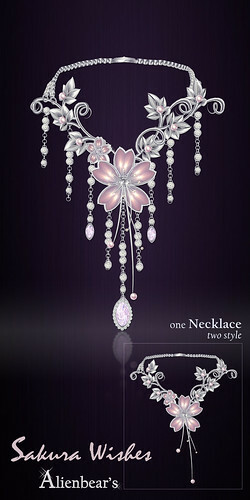 Due to prim limitation, this necklace have to be wear to 2 body attachment point. P.S. This length of the necklace is base on Mui Mukerji's Super Model III shape to design. Apart from this Greece version, I made the white version in platinum for the white lovers. In order to give details of this Calypso, the diamonds here I used are not just pure white but also some very pale babyblue diamonds. Haruka was my old 2010 early Spring design expressing the morning of the early Spring. Haruka means flower in spring, Leaves, flower bug & dew drops are the main design of this collections. I used colour gems , diamonds & pearl in this set. This set includes ring, necklace and earrings which having 3 colour tones for your selections.